It's not secret that I'm a massive fan of Blair Waldorf from the TV Programme Gossip Girl. I thought I'd share some of my favourite outfits I've seen her in on the show. Blair is almost always in skirts and dresses - have seen her in shorts a couple times, and maybe trousers once in a blue moon, but never jeans or sweats. I love that about her. I love that probably because I'm a skirt and dress type gal myself. I do admit to owning tons of jeans, but honestly I hardly wear them. I find trousers and jeans never fit me exactly right, but you can always find a good fitting skirt or dress for any body type. Anyway, let's see what Blair is wearing. 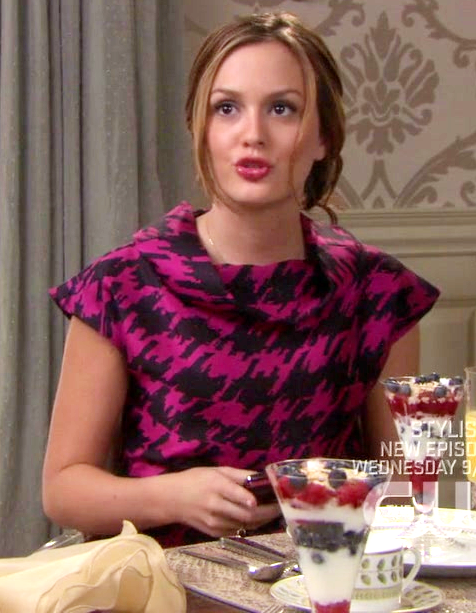 Blair in Marc Jacobs - this is one of my favourite dresses of Blair's. Another photo of the above dress, finished off with lovely accessories. Old skool prep - love the skirt and simple black top. Gorgeous in white lace and beautifully accessorized with black lace tights. Looking lovely in a wedding dress, although not too happy, are you, B? 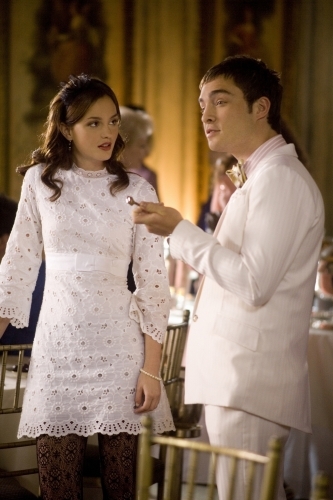 Are you a Gossip Girl? Does Blair inspire you or are you more of a Serena girl?